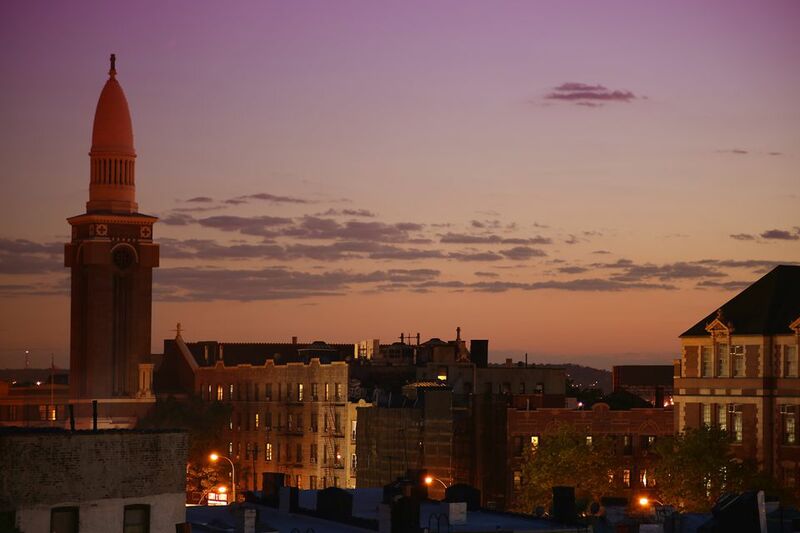 Sunset Park may be one of Brooklyn's most diverse neighborhoods and has been referred to as one of Brooklyn's coolest neighborhoods. Here you'll find charming brownstones, a thriving Latin American culture, Brooklyn's largest Chinese community, and a recent influx of young New Yorkers in search of cheaper rents. In recent years, the area has flourished into an arty metropolis. The once vacant industrial buildings lining the waterfront have been transformed into a center for makers, artists, foodies, and creative work spaces. A trip to Sunset Park wouln';t be complete without a visit to Industry City. The neighborhood's multicultural makeup is only part of its charm. The park that gives Sunset Park its name is a beautiful piece of land that offers stunning views of Manhattan, downtown Brooklyn, and even Staten Island and New Jersey. Sunset Park stretches south from 15th Street at the edge of Park Slope and runs north to 65th Street, where it is bordered by Bay Ridge. The neighborhood runs to 9th Avenue and Borough Park to the east and Upper New York Bay to the west. Sunset Park can be accessed by subway on the D, M, N, and R trains. Six bus lines also serve the area: the B9, B11, B35, B37, B63, and B70. You can also get there from the NYC Ferry. Sunset Park is home to a large latino community and is known for its plethora of Mexican restaurants. Folks travel to Sunset Park for incredibly tasty and inexpensive tacos and tamales. Favorite spots include Tacos el Bronco. If you’re heading there for lunch the $1.50 tacos should appease all taco lovers. And if you think you can’t get good food for under two bucks, Tacos de Bronco made the list of top Mexican restaurants in NYC by Food Network Magazine. Don’t want to sit down for a proper meal? They also have a food truck parked on 5th Avenue in Sunset Park. For a fun brunch, go to Maria's Bistro Mexicano in Sunset Park. They offer an unlimited Bloody Mary and Mimosa brunch. The bar scene is limited, you can drink at Industry City Distillery or if you want to hang at dive bar, go to the Grumpy Cat Bar. The neighborhood's main draw is its 24.5-acre namesake park, a green gem that offers gorgeous views of the Statue of Liberty, the Manhattan skyline, Staten Island, and New Jersey. A favorite among locals, the park also boasts a large playground and a popular public swimming pool. History buffs won't want to miss Green-Wood Cemetery, a beautifully landscaped landmark located in the heart of the neighborhood. The cemetery's four ponds, rolling hills, enormous trees, and flower gardens attract visitors from throughout the city, and you could easily wander around the grounds for hours. Once known as Bush Terminal, Industry City was originally a 19th century warehouse and distribution center. However by the 1960s, with the decline of urban manufacturing, Bush Terminal lost its tenants and had a long period of decay. In recent years this industrial complex, housed on a thirty-five acre waterfront stretch of Sunset Park, has been transformed into a mecca for arts, culture, dining, and shopping. The complex is also home to artist studios, work spaces, and a stellar food hall. From sunset yoga classes to traveling art exhibits, you will definitely find a reason to visit this unique space. Shopping is plentiful. If you're on the hunt for furniture, Industry City is home to an outpost of abc carpet & home, Restoration Hardware Outlet, Mitchell Gold + Bob Williams, Design Within Reach Outlet, and many other shops. It's also home to The Brooklyn Flea, which sets up each Saturday from 10 a.m. to 5 p.m.
Industry City has one of the best food halls in NYC. Sit at a picnic bench at the open food court as you dine on avocado themed dishes from the inventive Avocaderia, the world's first avocado bar, or have a slice of coal oven pizza at Brooklyn local favorite Table 87. Ethnic eats also abound including an outpost of Yaso Tango, where you can delight on tasty soup dumplings or have an authentic Berliner Döner Kebab at Kotti Berliner Döner Kebab. These are just some of the many savory highlights. You can easily spend a day eating dessert there, grabbing an ice cream cone from Blue Marble, cookies at One Girl Cookie, or relaxing with a latte at the bicycle themed cafe, Maglia Rosa. Shopping in Sunset Park is an experience that reflects the neighborhood's diverse background. Fifth Avenue is filled with grocery stores and Latin American markets, while the always-busy Eighth Avenue is the main hub of Brooklyn's Chinatown. Here you can stock up on paper lanterns and a variety of specialty Asian foods and ingredients. Don't forget to visit the food court at the Fei Long supermarket for some of the best fast food asian cuisine. Be sure to leave time to peruse the aisles of the supermarket.